I hope you had a very happy holiday season and that 2015 will be a great year for you. I’ve been super-busy lately, working with with my students on their lessons and on another video project in which a couple of my non camera-shy students have agreed to appear. We’re having lots of fun putting it together and it should be finished and posted here in the blog by mid spring. Keep studying, practice well, and I’ll see you next post. This entry was posted in A Melodic Ear-training, B Harmonic Ear-training, C Rhythmic Ear-training, Ear Training, General Info on December 29, 2014 by Art Matthews. During the 1990s (ancient history now!) I had several experiences with making music for a few computer/video games and other less populated outlets such as music for an ice cream truck, live “muzak” in grocery and department stores. When the opportunities were offered to me, I thought, “I’ve never done that! Why not try it‽” So I did, and I had loads of fun. I learned a lot about those particular aspects of the music business and I got to work with some great people. Many years later, when Jason Peter, one of my local students who does in-office and online lessons, first started asking me basic questions about MIDI, sequencing, and electronic music in general, I was more than happy to share with him my experiences and what I’d learned. Jason, who’s an awesome drummer, is still studying music with me today and I’m very happy that he has continued his involvement with keyboards and sequencing in addition to his other musical interests. On any given lesson day, he’s apt to bring a project to class on which he’s working and whenever he does, we make his project the focus of that day’s lesson. Check him out just below in the short video he made about a project for which he composed, played and produced the music. Jason is testing his light show systems in this clip. This entry was posted in General Info on December 22, 2014 by Art Matthews. You’ll find this free utility inside of my store in the “Study Materials” section in the right sidebar. It is a script that can assist you in getting to know the functional names of most of the intervals contained within any give one-octave range. For anyone who may have questions about how to use the utility, here is a short video clip of me demonstrating a few examples of how I use it. Even with its limitations, which are documented in the script’s on-board instructions, I still like to use the script because it can be run off-line directly in your browser. It may be run manually or automatically, and it hardly takes up any hard drive real estate because of its very small file size which makes for a fast and easy download! Download the script then “kick back” and use its hands-free mode to be quizzed on ascending and/or descending intervals within an octave. This entry was posted in General Info on September 2, 2014 by Art Matthews. During the 14-years I spent as one of the resident pianists at the Westin Hotel, Copley Place, Boston, MA, I accumulated many experiences and stories I’ll be sharing with you from time to time about my experiences with lots of very interesting people I met at the hotel. One night during my first set, as I was playing a few solo-piano warm-up songs before bringing out the rest of my trio, I noticed some faint flashes of light coming from the rear of the room. Thinking it was someone with a camera taking tourist photos, I just ignored it. However, when the flashes continued with increasing frequency, I ruled out tourist picture-taking! These flashes seemed to be directed at me specifically to get my attention. Was this person sending me a message in Morse Code or playing a practical joke or some kind of prank on me? I became more and more curious as it continued! So, near the end of the first song, I turned my head slightly toward the back of the room and I spotted the source of this mysterious happening! It was coming from a very well-dressed gentleman also in a tuxedo who was seated alone at the very last table in the back of the room and he was looking through something he was holding in his hands which was pointed directly at me. I turned my head back towards the piano and got back into the music. The flashing continued consistently throughout my warm-up. As I signaled for the bassist and drummer to come on up, I took a short break to introduce myself to this gentleman but by the time I arrived at his table, the mysterious contraption he had in his hand was nowhere in sight. I introduced myself to him and he said his name was Jimmy Lyon. At that time, I had no idea who he was and I asked if he had any requests. He said not right then but he’d be back in a while after he played a set or two across the street at the Copley Plaza Hotel. That told me he was a pianist so I knew I’d go visit him on my first break but before he departed, I asked him about the object which had been reflecting the spotlights back into the corner of my eye! He apologized for the distraction because he didn’t realize a reflection was occurring! I assured him it was very faint and that I was fine with it and not offended in any way whatsoever… I was just curious as to what it was. So he took the object out of his pocket and handed it to me. It was a very classy looking flat rectangular box that looked much like a personal cigarette case but when a special button was pressed, it turned into a set of pop-up adjustable-focus-telescopic binoculars! He said he liked my playing and he wanted to see how I was voicing chords and making runs. Rather than stand right behind me to look over my shoulder, he said he preferred to sit in the back and watch with his pop-up specs. Both of us started laughing so hard!!! Right away I knew he was a wonderful guy with a great sense of humor! I took a look through those binoculars and though they were small, their telescopic ratio was very good with great clarity! As I recall the account now in 2014, I still laugh about it! Shortly after introducing ourselves, both of us went back to work but as I got back to my bandstand, I asked my bass player, who was either Teddy Kotic or Rodney Richardson at that time, if he’d heard of a pianist named Jimmy Lyon. He said he certainly had heard of him and he gave me the “411″! That’s how I first met and learned about Jimmy Lyon! Eventually Jimmy returned that night with his “pop-up spy specs” to check us out again and with every opportunity I’d get, I’d go across the street and listen to him for what turned out to be MY “nightly piano lesson”! From my point of view, I believe I learned more about voicings from him than he learned from me but we continued our frequent visits with each other during the rest of his tenure at the Copley Plaza. I was working 7-nights a week at the Westin and he was working 6-nights a week. I learned a lot from Jimmy in the short time I knew him and when the time eventually came for him to return to his home in Paramus, NJ and his gigs in NY, I thanked him for his kindness and let him know that I was very much looking forward to his next return to Boston, but it wasn’t meant to be. He passed away all too soon! What a song specialist! A true gentleman through and through! I was very privileged to have been able to count him as my friend for the short time I knew him! Here are five audio clips I recorded of him (with his permission) that you’ve never heard, unless you were there the nights I recorded him. The audio quality is not the best you’ve ever heard and you’ll hear people talking throughout each song. if you can ignore the distractions and you want to hear Jimmy playing solo-piano in a very relaxed mood, then here you go! Ear training students, beginners, intermediates and advanced, might use these files as source material too! Pick out some melodies, or chord progressions or voicings that interest you. In any case, enjoy! Full Name : James Frederick Lyon. Profile : American jazz pianist. Born : November 06, 1921 in Morgan Village, Camden, New Jersey. This entry was posted in General Info on August 25, 2014 by Art Matthews. is a subject about which I first posted in AC #22. I teach this subject in depth to intermediate and advanced students who want to undertake and learn this demanding style of piano playing. However, in this post, I won’t “talk shop” or speak to you about any techniques on how to play them. Instead, I’ll focus the video spotlight on Milt Buckner and Andre Persiany (sometimes spelled “Persiani”) and let them show and give us some examples of how block chords sound and how much fun they can be as the two of them stage a very humorous and playful piano battle. The overall quality of the video isn’t the best ever produced but the most important things about the clip still shine through! Several quotes! Lots of fun & love! Since this is a “watching and listening post” only, let’s start by watching these two masters at work. Enjoy! 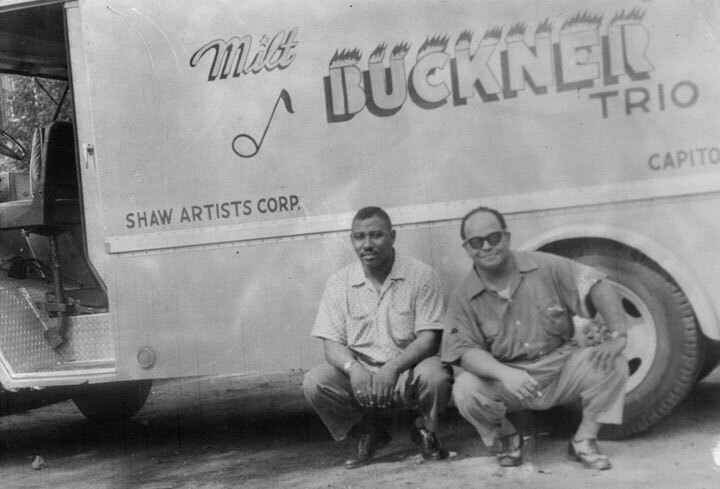 Four select audio-only clips that showcase more of Milt Buckner‘s “block chord” Style! If you’re interested in adding more block chord stylings to your piano playing, be sure to listen to more of Milt Buckner in this context and the any of the many pianists like George Shearing who cite him as their main influence for adding the block chord style to their pianistic abilities. Well, it looks like Milt and his friend may soon drive off in their band truck after the photo op, so I’ll hop into my Radio Flyer wagon and head home to study. This entry was posted in General Info on July 28, 2014 by Art Matthews. Here’s how you can tell if you, your child, or someone you know has a talent for music. One of the oldest and surest ways to tell is to notice if an ability to pick out melodies by ear on the piano, whole or in part, is present. People of any age who can play and reproduce melodies on the piano, on their own, without having any music lessons, have a natural talent for music. On one hand, there are many children who’ve demonstrated this ability at ages as young as two and three and discovering this talent at such early ages gives children a chance to get an early start on their musical journey. On the other hand, there are many people who’ve gotten started a little later or a lot later and many of this group have often discovered they, too, have this natural ability to pick out melodies and even more. Keep in mind that as melodies are being picked out, perfection is not required because flawless execution is not the decisive factor in determining whether or not a talent for music is present. As long as songs can at least be half-way recognized, talent is present and lessons are in order! If you can even partially pick out any of the melodies below, I’m interested in working with ya. However, even if you feel you don’t have this ability because all of the melodies you pick out are not even remotely recognizable, don’t despair because if you like music and music speaks to your soul, chances are your talent is hidden within you and needs to be uncovered and developed. This ability can be learned through “ear training” and practice. Picking out melodies may be described as the ability to find a starting source pitch by ear, reproduce it on the piano, and then match the intervalic movements of each subsequent melody note in relationship to the last or previous note that was played and correctly identified. Simply put, it’s a kinda “what-is-this-note-and-where-did-it-go-from-here” exercise and your success at picking out melodies depends your skill at distinguishing half steps from whole steps. As a follow-up to post AC #49, here are ten melodies on which you can practice and sharpen your picking-out-melody skills. Each song, with its multiple courses, repeats three times. This activity works best if you use a piano, a keyboard, or some other real-world instrument, but If you aren’t near one, try using this onscreen piano keyboard just for fun to play along. The levels of difficulty range from fairly easy to a bit arduous. Try a few! See how you do! A short revisit post on “block chords” is coming soon, so here’s a song with a “blocked melody” . Here’s a jazz tune with a bluesy melody. This entry was posted in General Info on July 21, 2014 by Art Matthews.